I am afraid of this clock. I found it staring up at me from a pile of magazine clippings. This clock is my life. I have no concept of time, which usually doesn’t bother me. But lately the things I have in place of numbers have fallen away and I am not able to navigate very well. My confusion is growing by the day, and I can’t process or remember things. I am so tired. I don’t know what’s going on. 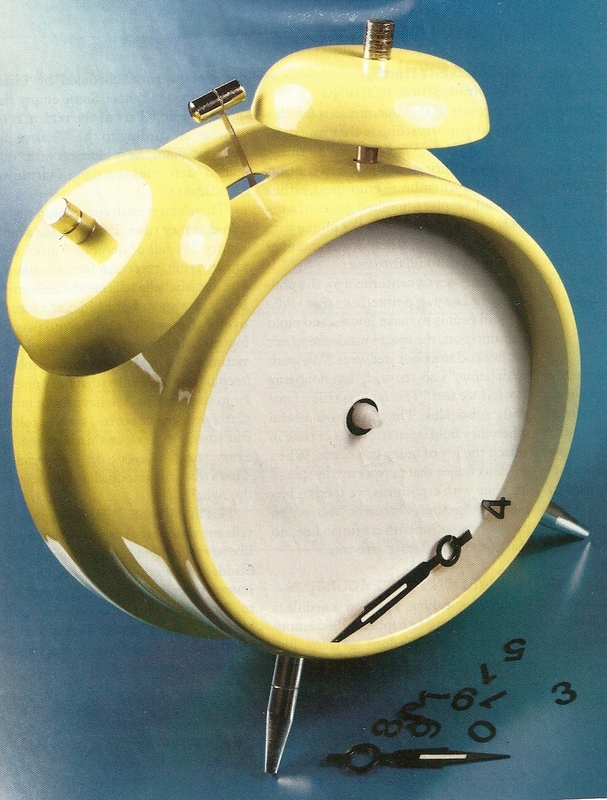 I am the yellow clock. My motor keeps on ticking, even though my hands are broken and my numbers have fallen away. I would buy it. The tick’s all I care about anyway. I don’t want to know what time it is. Time increases my anxiety. You have to do this right away or that by tomorrow. Hurry up. Call him now. Answer the phone. Have you sent that email? Did you prepare for tomorrow? What’s tomorrow? I don’t even know today. And I don’t care about tomorrow. Can’t you see? I don’t know what’s going on in my brain. Whatever it is is good at what it’s doing. Last year I thought I was gonna die, and I didn’t. But I’m not convinced that I’m here to stay. Or even if I am how much longer I will be Michelle. I’m scared because I don’t know it, I can’t control it and it won’t go away. It is slowly taking me. The clock cannot fight the clock maker. I can’t even see what He’s doing. I just watch how it affects me. I once was an intelligent person. Now it’s a struggle to order dinner. I don’t understand things. My emotions are not in my control. I don’t read. I write when I can. And can is fading. I can’t remember. (staring…) Please. If you find me please tell me what time it is and what that time means. To be a foundation, a guide. To know what’s going on at all times and to be right. To always be on, to be perfect, to propel the world. So what happens when a clock does not work anymore? How do I become an art piece? What do I do when it’s my job to sound the alarm and I don’t know what time it is? When I am the fire alarm and I’ve forgotten what fire is? When I know what fire is but I can’t make a sound? I don’t know how to be an art piece. I just know I need to learn. This entry was posted in Illness, Journal, Poetry and tagged i am the yellow clock, illness, journal, memory by writingtowardshappy. Bookmark the permalink.